Want to keep your playing shape this summer? Our weekly workshop will help! It’s designed for all school-aged bowed string players with at least one year of experience. 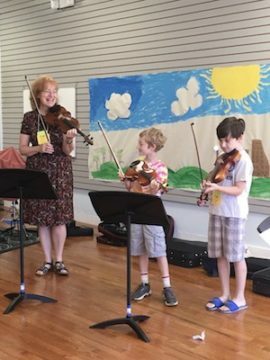 We’ll combine playing in a big group for ensemble skills, and smaller groups for attention to technique and getting musical details in shape. Joining this group will help you get more comfortable with playing different parts in a group, reading music, and making new friends! Musical selections will be made based on what you can manage and what we think would be fun to play! We will also consult with your school orchestra teachers so that we can help you be ready for your school groups in the fall. Meeting time: Wednesdays, 9-11 am or 10am to 12:00pm, depending on placement. We can accommodate kids who need to stay the entire 9am to 12pm time frame. Dates: May 29 to August 14, 2019. Players who started in 5th grade school programs and are entering 6th grade. Players who have had private lessons for at least one year but have not played in an ensemble. Players with 2 or more years of school instruction. Players with 2 or more years of private instruction. Cost: $100 for the summer. Prorated rates may be negotiated if you can’t attend all the sessions. Financial assistance available based on need. All sheet music and mid-morning snack included. 8:00am drop-off option available at $5 per week.